Whether it’s about Star Trek-esque replicators or killer robots, people have this deep need to push technology well past it’s practical limit. It’s no longer about the technology but it’s ability to evoke our deepest hopes and fears. We no longer have to wait for technology to be “sufficiently advanced”, we’re lowering that bar so fast we’re selling sentient homes as if they exist. What’s going on? In the 70s, Alvin Toffler wrote Future Shock, a book about the increasing rate of change in society. It’s premise is that too much change in too short a period of time causes intellectual paralysis. Most technological people laugh this off. “That type of shock is for dinosaurs, not me!” Yet it’s hard not to feel that the rate of change has become so fast that even the most technologically savvy of us are feeling it’s effects. Paralysis has been replaced with the need to make sense of it all. It’s like the web has become a giant opinion machine with everyone yelling “no, I’ve figured it out, listen to me”. We’ve moved from an online culture that used to focus on building, to one that spins in place around extrapolation. My point is that we are simply getting ahead of ourselves. Edison had it right over a century ago: Vision without execution is hallucination. The desire to ‘make sense of it all’ is so strong that we jump to some future extreme without ever really acknowledging how much needs to fall into place to be even remotely possible. We are creating paper visions. This isn’t a new observation on my part. I’m only calling out what the Garner Hype Cycle has been graphing for years. (If you don’t know about this influential analysis tool, I strongly recommend you check out that link) The hype cycle has proven over and over that we have vision without execution. When a technology first comes out, we go a little crazy, assuming it can do far too much. This has been going on for so long it’s now quite predictable. 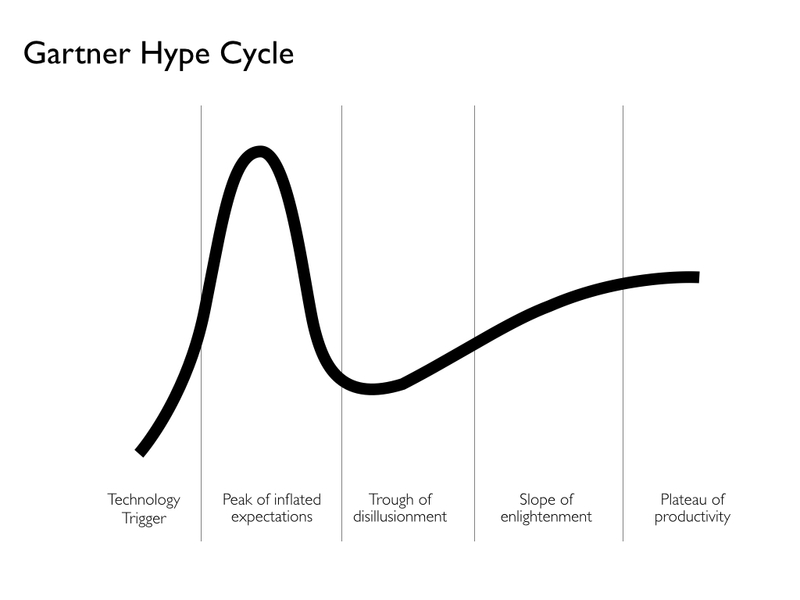 When I’ve discussed this with colleagues, they see this hype cycle as an unfortunate right of passage. To them, our irrational view of any new technology is a fever that will only pass once we get through Gartner’s “Peak of Inflated Expectations”. That is such a waste. Can’t we merge the experience that comes from both UX design and Technology to invent products that are more insightful and balanced without going through a very expensive “Trough of Disillusionment”? One of the core values of Design Thinking is to focus on the journey rather than the destination. Instead of assuming the end goal, you look around and see what steps you’d need to get there. More importantly, you explore what real people might actually do with this crazy thing. Doing this almost always discovers a much different product. Prototyping isn’t something that applies to our products but to our very thinking. Clark’s Corollary shows how we romanticize (or sometimes demonize) where a technology will go, cutting off the very exploratory work we need to do for proper understanding to take place. Having your eyes opens means that you must sweat the details, work through how a technology will flow. To just jump to a magic conclusion and assume it’s inevitable is the highest form of naiveté. Our love affair with technology suffers from a simple arrogance: we assume that working “most of the time” is good enough. My plea is simple: let’s stop predicting the future and start building it. How we understand technology beyond a trivial demo is the much harder problem to solve and there are no simple tricks. It’s hard, dogged work. So before we jump too far into the future, let’s keep our eyes open, build something (anything! ), and discuss what we learn. Dare to be wrong, rejoice and share when it works. That’s how sufficiently advanced technology gets built. One stubbornly obvious step at a time.